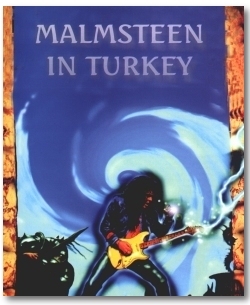 Our Turkish Team Member Ayhan witnessed, as the latest -and probably the most controversial - tour of the guitar hero of all guitar heroes, Yngwie Malmsteen, reached Istanbul, Turkey. Year 1998 should be happiest and tiring year of Yngwie Malmsteen. He had released a well produced 'Facing The Animal' album and his first Concerto album 'Concerto Suite For Electric Guitar and Orchestra in E Flat Minor Op. 1'. 1998 was never that short, he also released a live album and video called 'Live In Brazil 1998'. That year, Malmsteen had the happiest moments in his life, he had his first baby 'Antonio Yngwie Johann Malmsteen'. I was there on his first live show in Turkey so I didn't want to miss him this time. When I arrived at 6 p.m. a few fans already gathered in front of the venue, but no one seemed to know who would handle the vocals... Okay, let's wait and see. When Malmsteen started the second song 'Crucify', everyone seemed to sing the words and his band were blown away. They haven't expected something like that! 'Bedroom Eyes', 'Blackstar' and great solo performance were the exciting moments. But after these songs I could clearly see and hear that Malmsteen wasn't in the mood and he seemed to get bored playing the songs for years. He wasn't that excited as he was on his first show in Turkey. Most of the following songs were without vocals and he played nearly 5 minute solos after 2 songs. 'Masquerade' and 'Bad Reputation' were the two songs he played afterwards. I personally didn't like his last album 'War To End All Wars' but 'Bad Reputation' could be the highlight song of the album. Amazing song and amazing vocal performance of Mark Boals and I was in the mood again. When the band left after 90 min. the fans still shouted for more. Everyone seemed to be excited and had real big fun but the ones that were there on Malmsteen's first show didn't show that excitement. This show offered a less energetic performance than last time.